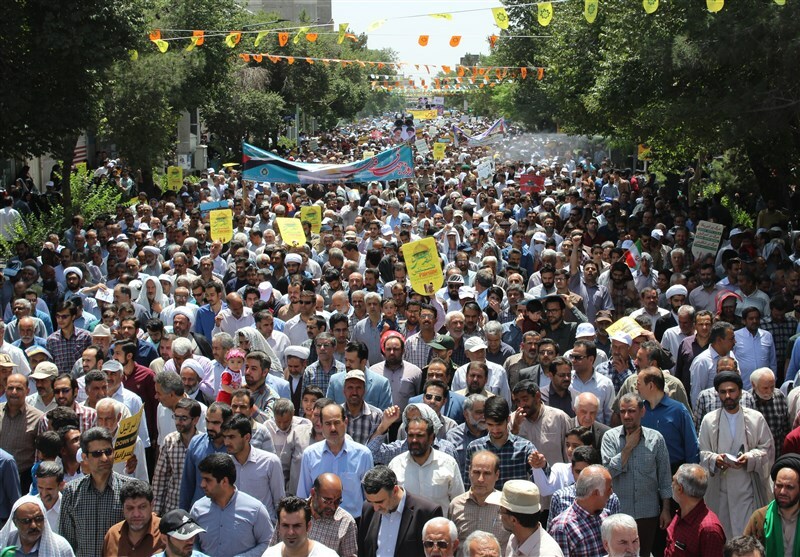 Iranian people attending nationwide demonstrations on the International Quds Day voiced support for the liberation of Palestine from the Zionist occupation in their final statement, stressing that elimination of the Israeli regime remains to be the Islamic world’s top priority. 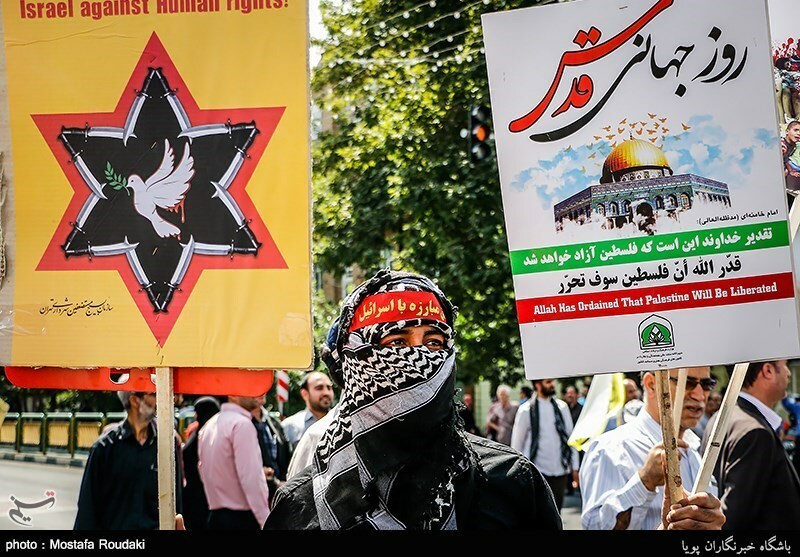 In a final declaration after holding mass rallies in Iran’s capital of Tehran and hundreds of other cities on Friday, demonstrators in the International Quds Day reaffirmed commitment to supporting the Palestinian people and the Islamic resistance, and described the efforts to liberate the holy city of al-Quds from the Zionist occupation as one of the Islamic Revolution’s primary goals. They also referred to the attempts to eliminate and destroy Israel –the region’s cancerous tumor- as “the Muslim world’s top priority,” and slammed any move aimed at sidelining the issue of Palestine. According to the resolution, the only way to settle the issue of Palestine will be the return of all displaced Palestinians from around the world to their motherland and holding of a free referendum to decide the fate of their country. The ralliers also called for unity among all Palestinian groups in the face of the “child-murdering” Israeli regime, and strongly condemned the Judaization of the Palestinian territories. The resolution has also taken a swipe at the US and Saudi governments for their hostile attitudes towards the Iranian nation. Millions of fasting Iranian people from different walks of life poured into the streets on Friday to join the demonstrations in support of Palestinians, who have been suffering from Israel’s atrocities for decades. Each year, the International Quds Day is celebrated on the last Friday of the Islamic holy month of Ramadan. The event’s raison d’être is renewing support for the Palestinians and denunciation of Israel. The day is also seen as the legacy of the late founder of the Islamic Republic of Iran, Imam Khomeini, who officially declared the last Friday of the holy month of Ramadan as International Quds Day back in 1979. 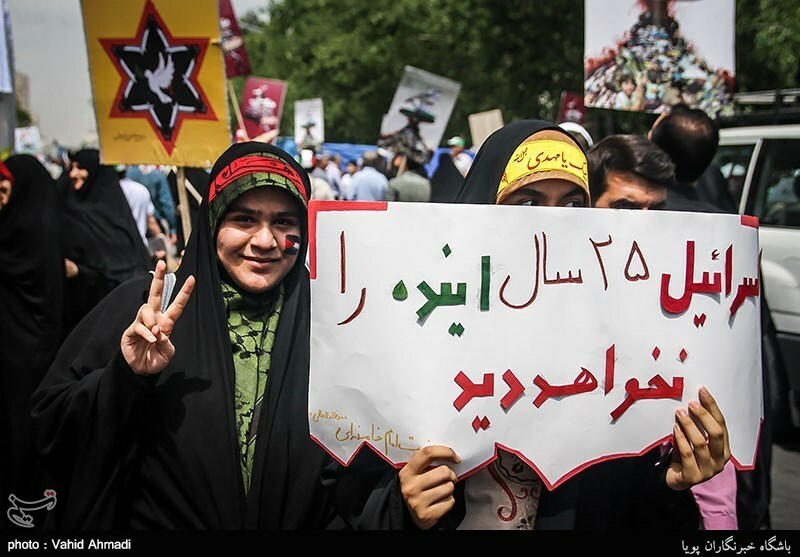 In comments on Wednesday, Leader of the Islamic Revolution Ayatollah Seyed Ali Khamenei described the International Quds Day as “the symbol of fighting Arrogance and global hegemons”. Next articleAP This Week: “Millions of Palestinian Refugees and Their Descendants” – What, Again? Please check your inbox to confirm your subscription. © A WEBstationONE.com production, partially funded by the Internet Development Fund and the IDF Link technology. © 2003-2017 All rights reserved. Articles and Special Reports on IsraelBehindTheNews.com are copyrighted. Readers should feel free to reprint, distribute and use the material herein, with citation and appropriate reference to Israel Resource News Agency.